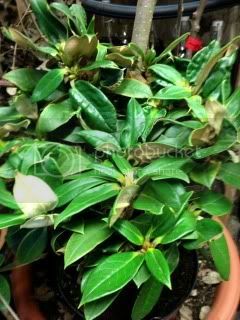 Last winter (2012) I came across this new elepidote hybrid with fragrant leaves in the internet. It was very puzzling as I had never heard of an elepidote with scented foliage. Googling revealed commets by William Shearer in Sweden praising the scent of Honigduft but not much else. Next, I found a German webshop (rhodofreuden.de) selling Honigduft and ordered one immediately. Rhodofreuden states that Honigduft is derived from R. taliense. It is probably not hardy enough in southern Finland but have to give it a try. When I received the parcel from Germany in February I noticed the sweet honey scent even through the cardboard box! Later on, I did some experimenting and found out that the scent comes from the undersides of the leaves exclusively, possibly from the rather heavy brown indumentum. When planted outside the scent is much more elusive but I did catch it several times in still weather, when working nearby the plant. I'm of course interested in breeding with Honigduft to see if the foliage scent is inheritable (which would be great and would add a totally new dimension to elepidote breeding). I collected pollen and will use it on some hardier Finnish rhododendron next summer. Felty indumentum, putative source of the honey scent. 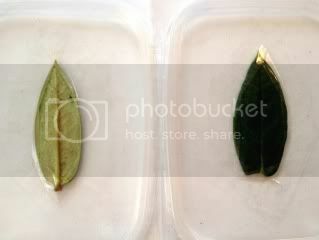 I did an experiment to find out from which side of the leaf the scent comes. 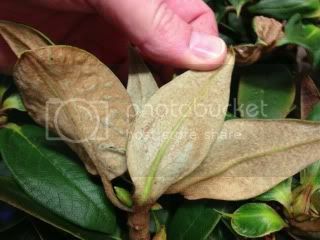 I taped two leaves tightly on plastic with uppser or lower side exposed and smelled blindly. My partner confirmed (also blindly) that the scent comes only from the underside.